Present state: Goods shed, station building and part of platform survive - the trackbed is now a car park for the cycleway. The station building is used by the Lancaster University Rowing Club. Notes: The Little North Western Railway opened a single line between Lancaster and Clapham in three stages. The first section to Wennington opened in 1849. The company was absorbed by the Midland Railway in 1874 and they doubled the line in 1889. Passenger services were mainly between Morecambe and Leeds/Bradford but in 1966 they were rerouted via Carnforth and Wennington and two years later this direct line to Wennington closed to all traffic. 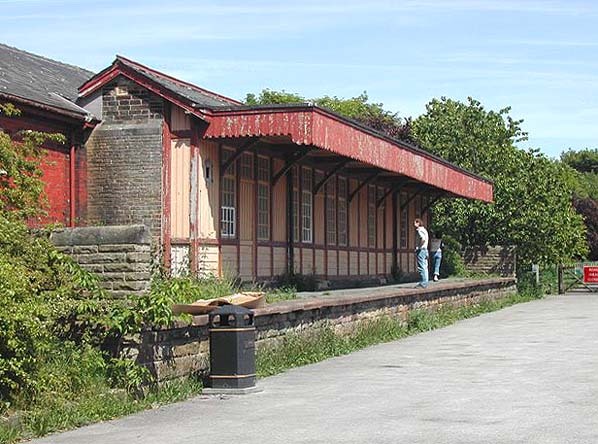 Route - when open: Green Ayre station in Lancaster was located on the south bank of the River Lune immediately east of the junction where the single line from Castle station joined the line from Morecambe Promenade. The line to Wennington then headed NE passing under Skerton bridge (carrying the A6 over the river) and, keeping to the south bank, soon went under the aqueduct carrying the Preston - Kendal canal. Halton was reached after 2.2 miles with a loop of the river (Crook of Lune) crossed by two fine bridges. From Caton it kept close to the Lancaster - Kirkby Lonsdale road (A683) and at Hornby it turned more westerly to follow the River Wenning joining the line from Carnforth at Wennington. The first four miles is now the Lancaster - Caton Cycleway. Beyond Bull Beck the course of line has reverted to agricultural use. Halton is the only extant station on the line.